Chateau de Clos Luce may not be the country’s grandest castle, but it’s still gained favor among art and history loving travelers thanks to its notoriety as the official final residence of famed artist Leonardo da Vinci. While the castle was once home to King Francis I, today it stands as a museum to the great painter’s works. 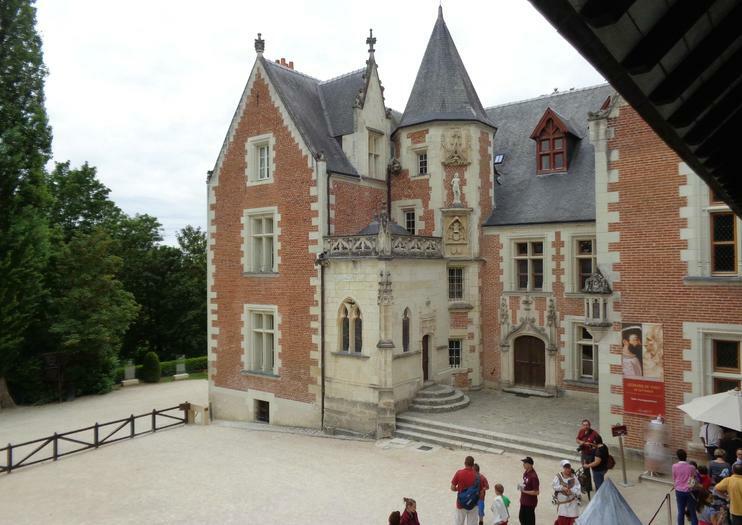 Travelers can wander the halls and check out more than 40 models and machines designed by da Vinci, as well as wander the underground tunnel that connects Chateau du Clos Luce to the royal Chateau d’Ambroise. Chateau du Clos Luce is located at 2 Rue du Clos Luce in Ambroise, about two hours from Paris and 400 meters from the Royal Chateau. It is accessible by train, car or bus. Although the castle is open daily, times vary depending on the month and season. Gain access to Chateau du Clos Lucé and Leonardo da Vinci Park for a whole day with this admission ticket. Step back in time as you learn about the history of Leonardo da Vinci, one of the world’s most famous inventors and artists. First explore the Chateau du Clos Lucé, where da Vinci spent the last three years of his life living. Then, move on to the park to admire some of his inventions, including flying machines, bridges, and weapons. Escape Paris and see the French countryside on a 4-day getaway to Normandy and the Loire Valley. Accompanied by a guide, you’ll visit the towns of Rouen, Honfleur and Saint-Malo, explore World Heritage–listed Mont Saint-Michel and learn about the World War II landings at Omaha Beach. Then discover the dreamy castles of the Loire Valley’s ‘chateau country,’ including Château du Clos Lucé and Château de Chambord. Transport and accommodation are included so all you have to worry about is soaking up the sights. See the incredible châteaux (aka ‘castles’) of the Loire Valley, a UNESCO World Heritage–listed region of France, on this overnight tour from Paris. With a guide, you’ll drive by coach into the French countryside to visit Château de Cheverny, Château de Chenonceau and Château de Chambord. See the château where Leonardo da Vinci lived at the end of his life, and learn about the histories of these palatial homes. On this 3-day adventure from Paris, experience two of northwestern France’s most beloved locales — the World Heritage–listed island village of Mont St-Michel in Normandy and the ‘château country’ of the Loire Valley, another UNESCO site. With a guide, learn about the architecture and significance of these historical landmarks, and enjoy spending the night in the towns of Angers and Tours. You’ll be awed by castles like Château de Chenonceau, Château de Chambord and Château du Clos Lucé, once home to Leonardo da Vinci. The sweeping vineyards and fairy-tale castles of the Loire Valley appear even more magnificent from above and this 20-minute helicopter flight is a perfect introduction to the region. Soar over the UNESCO-listed valley and spot landmarks such as the Château d'Amboise, Château de Clos Lucé, the Pagode de Chanteloup, and Jardins de Valmer. Venture into the scenic Loire Valley and discover its magnificent castles on this comprehensive day tour. Save hours researching and planning your trip by having everything organized for you—hotel pickup, drop-off, transfers, and entrance fees. Travel comfortably in a private vehicle and enjoy visiting Chateau de Chambord, and Clos Lucé with its beautiful park and Leonardo’s Garden. Visit some of the Loire Valley’s most iconic castles and gain insight into the region’s rich heritage on this private day trip from Paris. Leave the busy city behind and travel into the French countryside with a private guide. Visit the UNESCO World Heritage–listed Château de Chambord — widely considered among France’s very finest castles — the renaissance-era Château de Chenonceau and the 15th-century Château d'Amboise. During your tour, admire gothic architecture, fine artworks and beautiful gardens, and visit the resting place of famous Italian painter and mathematician Leonardo da Vinci. This tour includes a round trip TGV train ticket from Paris. Visit the famous castles: Chambord, Chenonceau and the Clos Lucé with a local guide and taste the delicate wines of the region. Everything is included: round trip train tickets from Paris, Loire Valley transportation, tour guide, castle entrances, breakfast, lunch, gourmet diner, wine tour & tastings and accommodation. The following day you are returned to the train station on your way back to Paris. This is a small group, limited to 8 persons max. Read more about this special two-day Loire Valley experience!